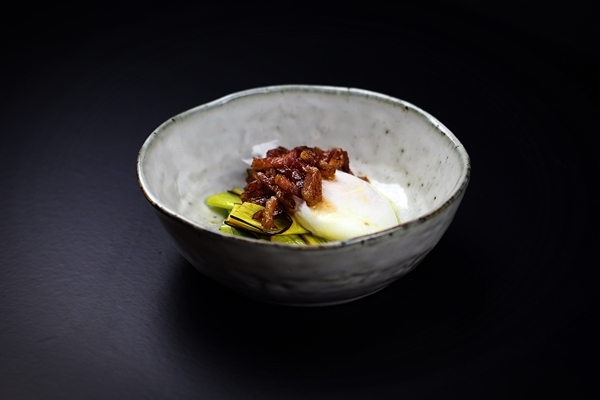 Try this recipe for Poached egg with leeks, pork and japanese soy. 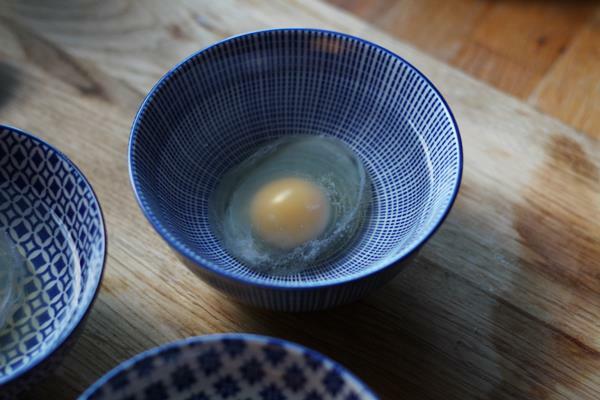 Add some Asian inspiration to your next dinner. 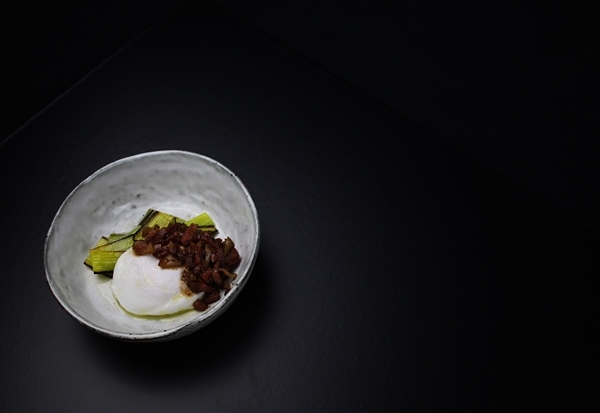 This dish is not very complicated, it’s basically bacon and eggs with soy sauce. At least flavorwise. I wanted to make a small dish out of whatever I happened to have in my fridge, that is a great tip when you are stuck creatively. Going shopping and having everything available but I rarely get very creative when I do that. For me the best ideas or at least the birth of a great idea comes when there is less to chose from or when there are other limitations. Now don’t make the mistake of having this approach if you’re very hungry, that will work poorly. But searching through the fridge when the mission is to do something tasty for just one, buying nothing could turn out to be a great idea. I had some leftover salted already fried leftover pork, some eggs and a leek that was kind of forgotten. 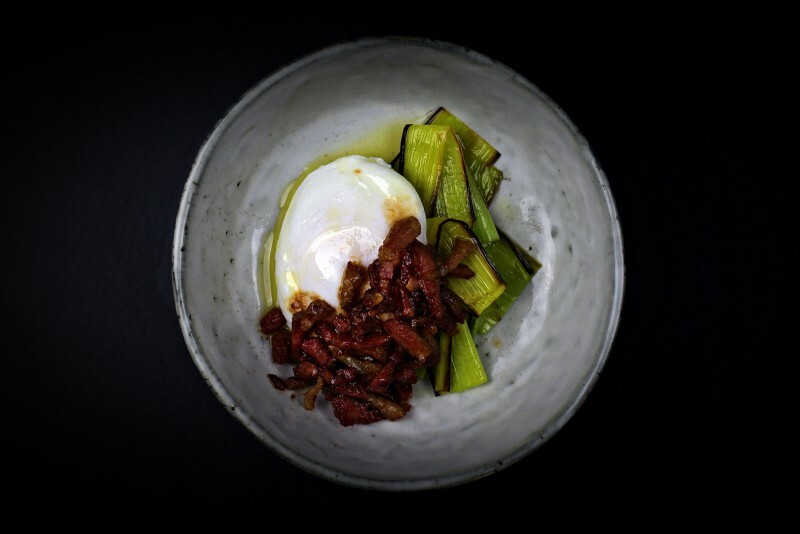 The salted pork is exactly like unsmoked bacon and eggs is bacon’s best friend. If you’ve had bacon and eggs you already know that adding some fried onions to that won’t spoil anything. So why not with leeks? To add a little bit of Asian flavor I added some Japanese soy to the pork once it was fried. It was just the thing to make the dish not just breakfast. Now try it. Start with the leek, cut it in half lengthwise and then into a few pieces about an inch long. Rinse with water and fry in olive oil cut side down on high heat, then lower the temperature. 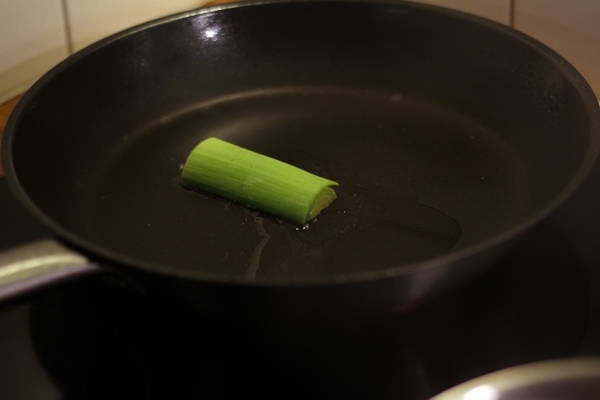 Tear the leaves of the leek apart and keep cooking on low temperature for a minute or two. This will give the leek a blackened roasted edge like you can see in my photo. It adds some flavor and it looks kind of cool. Set the leek aside. Cut the pork belly into thin strips and then fry in a pan with no oil. There is enough fat in the meat to make it perfectly crisp. Once crisp add the soy sauce and butter and let it melt together into a sauce, there will only be a few drops. I actually took this instruction from a similar dish with bacon and endives I did awhile back, it’s the same method. And if you like this recipe you’ll like that one too, check it out here. Carefully reheat the leeks and pork if necessary, add the leek and the egg on the side. Spoon the pork on top and make sure to use all of the soy and butter sauce. Add a few drops of olive oil and serve. Good luck.